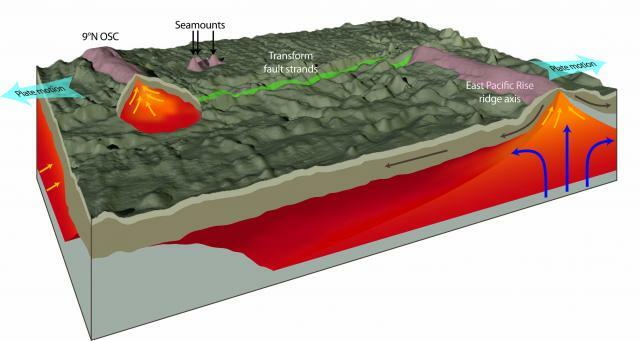 Three-dimensional illustration of the melt region beneath the Siqueiros transform fault located at 8.5°N on the East Pacific Rise (mantle not to scale). The region of the mantle that is melting expands up to 100 km on either side of the East Pacific Rise ridge axis creating a large region from which melt is focused to the ridge. Gray arrows indicate plate motion, blue arrows mantle upwelling, and yellow arrows melt focusing. At depth beneath the ridge (B), melt collects along grain boundaries (3D distribution of melt in a aggregate of olivine and 5% basalt imaged using high-resolution synchrotron microtomography, from Zhu et al., 2011). Panel C summarizes the three steps of melt extraction: (1) rapid, subvertical migration from the melting region, possibly in channels (red lines); (2) accumulation and focusing along a permeability barrier along the base of the lithospheric plate and (3) extraction to the surface in a Melt Extraction Zone (MEZ, blue box) associated with faulting and the magma plumbing system of the ridge axis and the transform domain. D) and E) represents schematically the structures potentially present underneath the ridge (D) and the transform (E) with black lines representing faults (Hebert and Montesi, 2011). Illustration by Jack Cook, copyright Woods Hole Oceanographic Institution.